Since summer 2012 the 30-year-old American lives and works in Dresden. "As I was finishing my dissertation, I started looking at postdoc opportunities and happened to see a presentation given by Professor Jochen Wosnitza, the director of the High-Field Magnetic Laboratory at HZDR, at a conference in Poland." Her advisor supported her application for a postdoc position in Dresden, which was successful. Shortly afterwards, her husband was also lucky to get a position as a PhD student at the ELBE radiation source at HZDR. In the beginning, it was difficult for both of them to find their way around without knowing German. "Luckily, our co-workers supported us. One of the other postdocs helped us find an apartment and register with the city while my officemate, assisted us with the necessary paperwork." At work, they mostly speak English. Today, Elizabeth's German is good enough for her to find her way around the city. She especially enjoys the work-life-balance Germany offers. After her son was born, about a year ago, she continued working right away, but appreciated the opportunity to take parental leave. Recently, she took her son with her to stay with her family in the USA when she went there to conduct measurements. She is also very fond of the nanny her institute found for her: "She used to be a nurse, so we know our son is safe with her, and her husband is a physicist so she understands the complexity of the work we do." Dresden is a beautiful, historic city to her and she enjoys living there. She has not personally noticed the recent "Pegida" demonstrations that have put Dresden at the center of a major debate about xenophobia in Germany. She feels understood and cared for at her place of work: "There was a meeting held here at HZDR last month to discuss the situation in Dresden and to see if the international researchers felt safe. I think that showed great initiative." 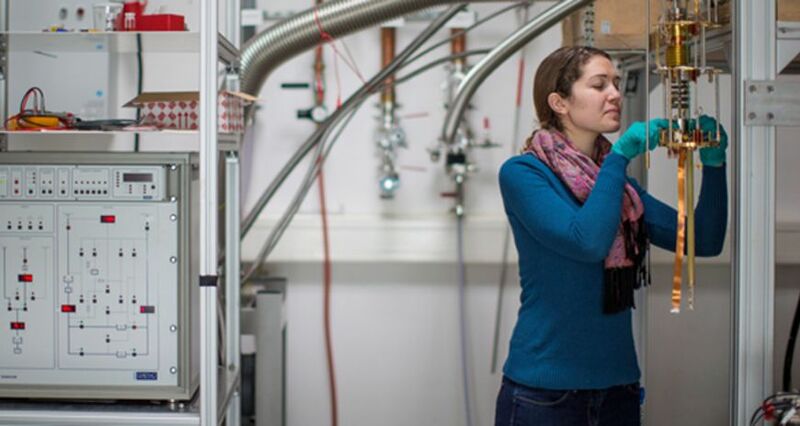 Elizabeth Green investigates the magnetic properties of matter, which play an important role in the behavior of semiconductors, metals and, even organic compounds. Superconductivity is an important part of her research. It is a curious state of matter in which it loses its electrical resistance. Superconductivity is important anywhere large magnetic fields are involved, from particle acceleration to medical imaging in MRI machines. Of HZDR's 500 scientists, 160 are originally from over 50 countries. The Dresden High Magnetic Field Laboratory is accessible to researchers from all over the world through the European Magnetic Field Laboratory (EMFL) partnership of Europe's leading high field laboratories. HZDR is one of four partners. HZDR's Ion Beam Center and the high-energy radiation source ELBE are being used by external research groups from many countries. The Ion Beam Center is the model for the Slovak nanotechnology center SLOVAKION, currently under construction in Trnava. HZDR is educating researchers and technicians for one and a half years to prepare them for operation. HZDR is educating engineers and scientists in Iraq. Researchers from Dresden are working with the University of Zakho on a laboratory for multi phase currents that will help develop new techniques for natural gas and oil extraction.